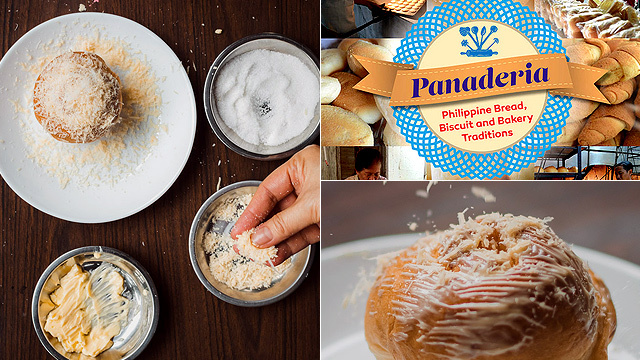 Plus, did you know that Bulacan ensaymada is different from Pampanga ensaymada? (SPOT.ph) The holidays are around the corner and in the Philippines, that means being showered with treats both sweet and savory. One of the most popular pastries all-year round, either as gifts or as party snacks, is the ensaymada. 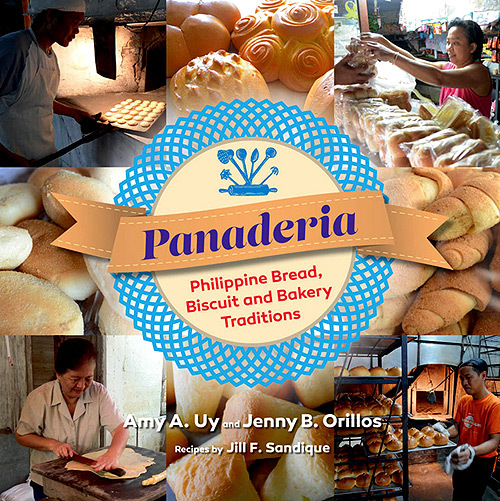 According to Panaderia: Philippine Bread, Biscuit and Bakery Traditions, a book on Philippine breads and pastries by Amy Uy and Jenny Orillos, with recipes by Jill Sandique, the ensaymada is "a coiled bread laden with fat such as lard, butter, margarine, oil, or a combination of these." Its name is "derived from saïm, a type of fine-quality lard used in making ensaimada Mallorquina," according to the Oxford Companion of Food. 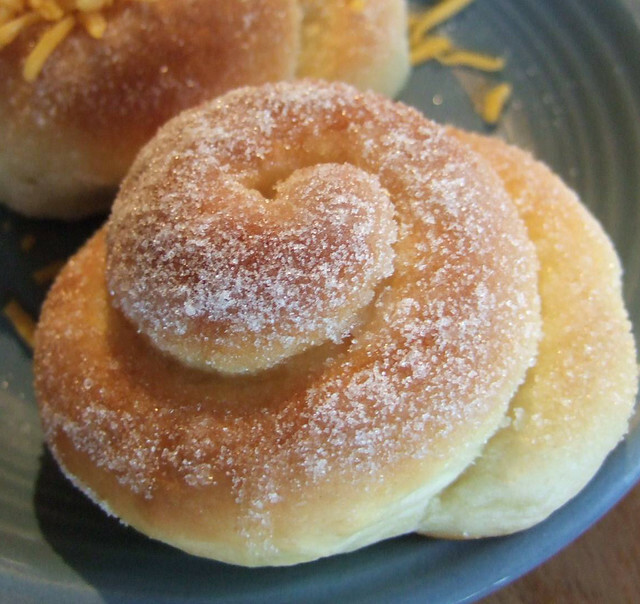 The book describes the ensaymada’s Spanish predecessor as "straightforward." "The dough is made from bread flour, water, sugar, eggs, and a starter dough. It is kneaded, rolled out into a very thin layer and spread with lard, coiled into a spiral by hand, fermented once for at least 12 hours then baked. The crust is dusted with powdered sugar." 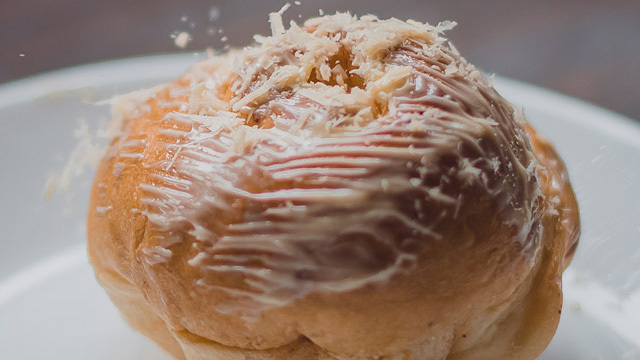 Manileños are most familiar with the kind of ensaymada that’s either just a soft, buttery pastry topped with a bit of sugar, or the more festive one covered in a mountain of cheese—the more finely grated, the better. In fact, there are different kinds of ensaymada. "You have to consider the context of the 'ensaymada' conversation. 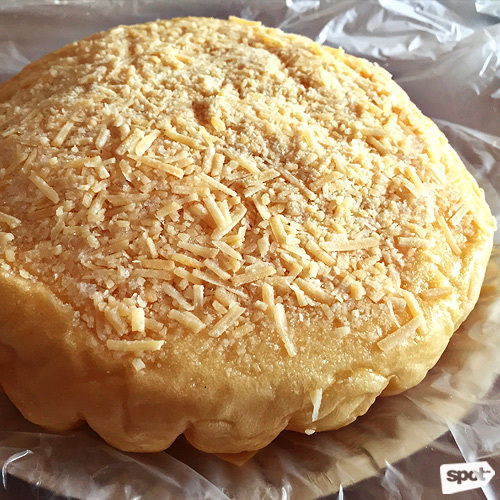 If it’s around Christmas time or you’re talking about giving it as a gift, it is most likely the special ensaymada (with grated queso de bola). On a regular day, it’s most likely the classic ensaymada topped with butter and sugar," Orillos explains. 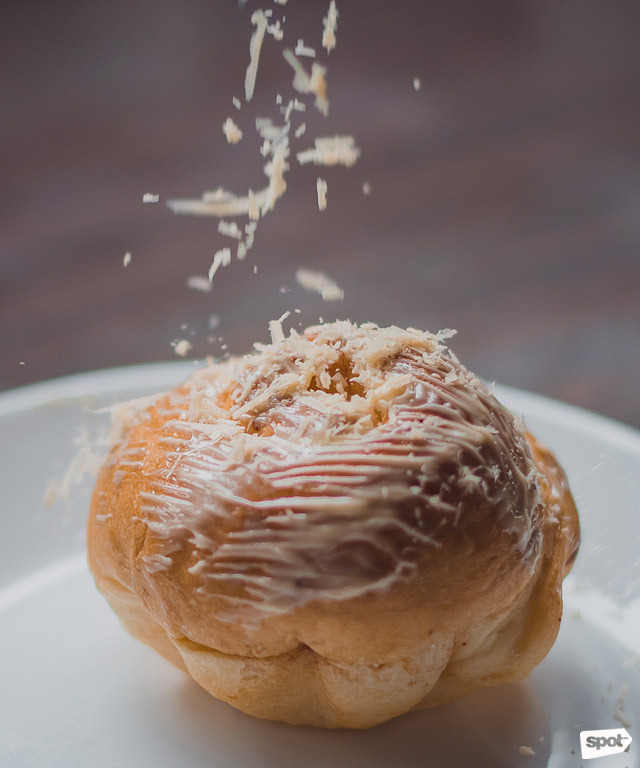 "Ensaymada can also take on a subjective meaning depending on the kind one grew up eating so that means 'ensaymada' can also be location-specific, such as Pampanga-style or Bulacan-style, or ensaymada from the panaderia or from the mall." She lists three main types, all based on "the same basic ingredients with bread as its base. The formulation (amount), method (sponge and dough, straight dough), rolling technique, and topping may vary from baker to baker. The variation gives birth to the distinctive marks in the ensaymada." 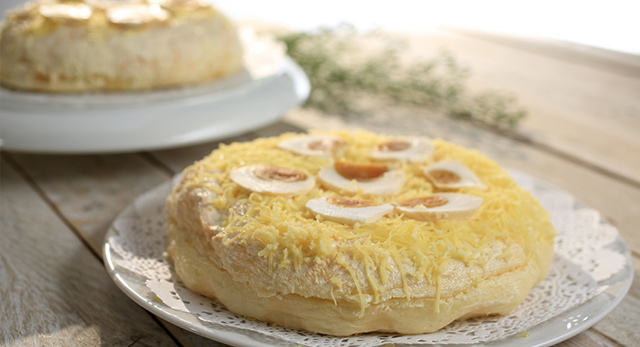 There’s Bulacan ensaymada, which “has the sliced salted duck’s egg on top that makes it distinctly Bulacan, more specifically from the town of Malolos. (In some affluent families, it is ham slices rather than salted egg)." Some of the best ensaymada recipes have been lost over time. Orillos’ book talks about the famed Panaderia Villegas of Bulacan, patronized by folks far and wide for its delicious, melt-in-your-mouth pastries, but whose recipe died with its baker. Then there is the Pampanga-style ensaymada, which is "most often large in size and rich in flavor (lots of egg yolks and butter), judging from the number of ensaymadas we tried from the province. It’s a bit tricky to trace Manila ensaymada because the older bakeries that used to make them did not survive to this day. If you look into the provenance of the heirloom ensaymada recipes of some Metro Manila home bakers, a few would have Pampanga roots while others will have tweaked the original according to their taste. The modern ones you see at the mall in Manila today are quite different from the traditional ones made in the past." There is also Manila-style ensaymada. "You can trace the roots of Manila ensaymada by way of the Spanish-era bakeries in Intramuros that made it similar to Mallorca in Spain where the bread originated. These Filipino bakeries had the most apt names: La Palma de Mallorca in Intramuros and La Mallorquina Bakery in Quiapo. In the 1920s, Manila was already making ensaymada flavored with cheese, butter, ham, or sausage. If you ask your Lola, she would be familiar with the ensaymada made by Maria Luisa’s Bakery and Annie’s Bakeshop both in Quezon City but now long gone." Orillos adds, "In researching for our book...we talked to Manila old timers who remember the ensaymada of their childhood—they described the structure of the bread as having crevices or layers, being flat because it was baked on a half sheet pan or cookie sheet rather than a brioche mould which will make it tall and billowy since the mould serves as an enclosure that limits the horizontal expansion of the dough. Someone also mentioned the top crust which you can 'peel off.' They also wax poetic about the lard (in some formulation) which gives it a distinctive linamnam flavor. 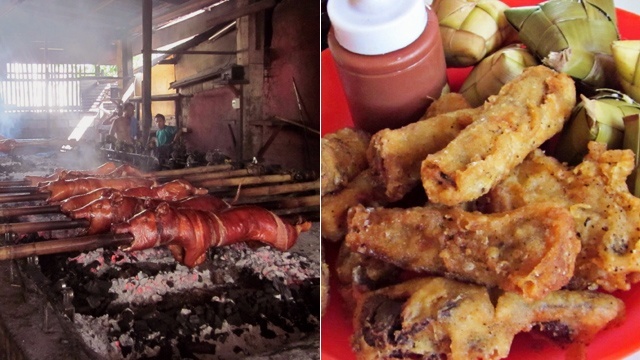 (The lard is not exclusive to Manila ensaymada, by the way.)" According to Orillos, one of the biggest misconceptions Pinoys have about ensaymada is "the more toppings of cheese, butter and sugar, the better the ensaymada" because "If you take out all of these trimmings and you have lousy bread underneath, it kind of ruins the whole ensaymada experience. You end up just nibbling on the top and leaving the rest on your plate," she says. "But there should always be good, honest bread holding the ensaymada together regardless of the preferred flavor (ube, classic, etc.) or topping. The bread is the body and soul of the ensaymada." I asked Orillos what makes for good ensaymada. "Foremost, the ensaymada must be based on a good bread from a well-made dough (long-fermentation period contributes to the flavor of the bread). The texture is tender with a bit of a bite or chew. It shouldn’t be dry or too moist from the butter or oil," she says. "The ensaymada must have that distinctive coil or spiral shape, its most important hallmark. The flavor should be a balance of sweet, salty, and fat (from the butter and eggs) that comes together when you bite into the bread and the topping. Finally, add a hint of nostalgia from your own experiences eating this bread and you got yourself a damn good ensaymada." Does Orillos have a favorite type of ensaymada? It turns out that she does. 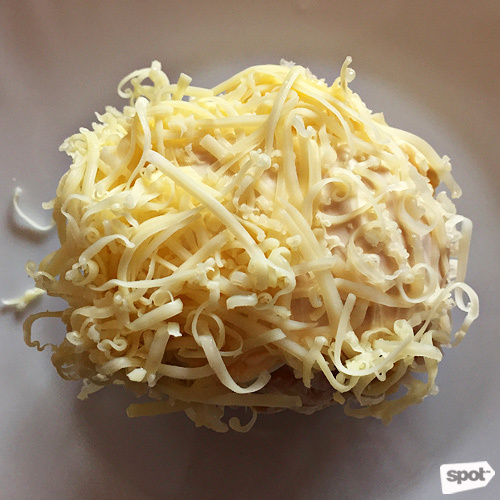 “I’m partial to Pampanga-style ensaymada because of its rich flavor and the fact that I can only get it on special occasions makes it a really special treat. I also like ensaymada with queso de bola rather than cheddar because the former gives it a bit more depth of flavor," she says. "But any ensaymada made with devotion and care by a home baker, regardless of the provenance of their recipe, I will gladly welcome [to] my dining table. Likewise, if we pass by a corner panaderia selling soft ensaymada for P12 (or less) with that crunch of sugar and that pop of yellow margarine, I’ll share it with you with a bottle of soft drinks. It’s what some childhoods are made of." Orillos is currently apprenticing in a traditional bakery to further learn about Filipino breads and pastries. 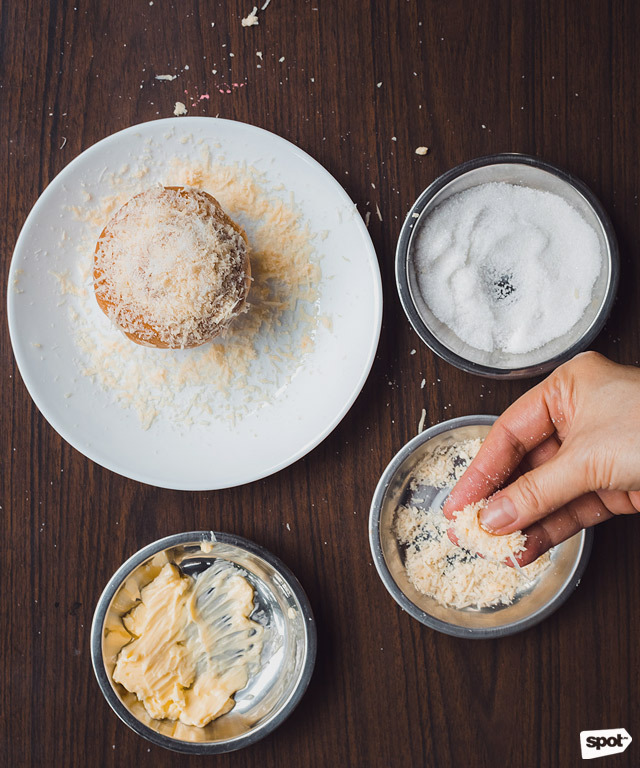 But working on her book has taught her a few secrets to making delicious homemade ensaymada. 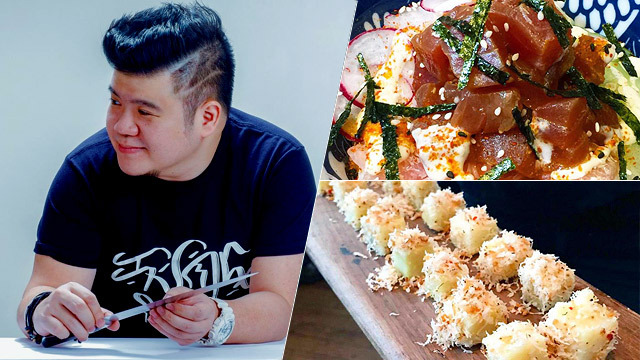 "Eating dozens of ensaymada for work has helped me understand what makes this bread so good. So taste a lot of ensaymada, learn from it, and then go back to your kitchen to master the classic way of making this bread," she says. "Use the best butter you can find because the flavor will make the dough and the topping shine. Make your ensaymada with a joyful heart which will translate to how much care you will put into making it. Lastly, after mastering tradition (you must have one classic recipe in your arsenal) and you wish to offer something different, innovate [with] flavors and toppings." Whatever style of ensaymada you prefer, be it topped with eggs, covered in cheese, or served warm and plain from the corner bakery, take heart in the fact that you’re partaking of a well-loved Filipino pastry, one that traces its roots back to Spain, but over the centuries has, as Orillos and Uy say in Panaderia, "a tropical exuberance in the hands of a colonized nation."